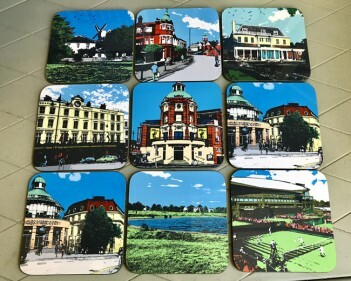 A selection of local images of Wimbledon created as coasters in a collaboration between us and Susan Taylor. These pop art inspired designs are exclusive to us here at Room Remedies. The images include; Cannizaro House, Wimbledon Tennis, Town Centre, Wimbledon Theatre, Windmill, Prince of Wales Pub, Rushmere Pond and Wimbledon Village. Each coaster is 9cm x 9cm.